Social media fraud is an estimated $200 million a year underground business. It’s fuelled mainly by ‘clickfarms,’ which exist overseas in countries like Thailand and Bangladesh. There are two types of clickfarms, the most high-tech of which are all automated. “A small room with racks and racks of smartphones, facing out so you can see the screen on every one and they’re all connected with cables powered into the bottom. Each of these phones is on all the time, they’re not touched. They have software on them that does the work of an individual. It’s programmed to head to a particular Instagram page and hit like on every single post,” Today Show tech commentator Trevor Long told The Quicky. Listen to the full interview with Trevor below. Post continues after podcast. “They could be programmed to look for a particular hashtag or certain keyword and hit like on those things. But also be programmed to log in and log out of hundreds and hundreds of fake accounts and hit like on a particular account,” said Mr Long. Social media likes and follows are the modern day currency. 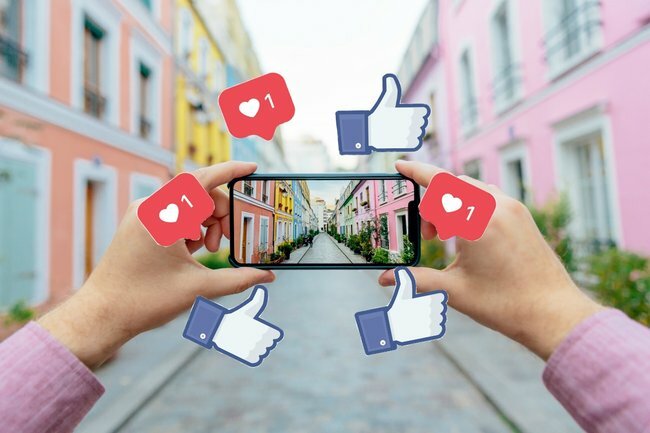 Whether you’re on Instagram looking for fame, or a business or Instagram account trying to bring in sales – those likes matter. They make other people think a certain piece of content is good or important. The same goes for followers. Essentially, it’s about social credibility or business reputation. But in some cases, both those likes and follows are completely fake. In 2017, a click farm in Thailand was raided – giving us a peek inside the clandestine industry. The three men arrested were using 475 mobile phones and 347,200 SIM cards to accumulate likes and views. They were earning up to $5,800 a month. But there are also click farms that are run by people. “One person is likely accounting for thousands of potential pretend workers in that click farm. It’s not a great job, it’s not desirable,” he said. These versions of the farms resemble sweatshops featuring hundreds of low paid workers sitting at a desk with tens of phones, following commands that a computer or piece of paper tells them to. A farm that resembles this type of operation was uncovered in 2013 in Dhaka. It was paying its workers $15 for every 1000 likes. A Times investigation in 2015 found a company in India offering $1 deals for every 1000 clicks. Belle Gibson faked her Instagram fame herself, by convincing her followers she had cancer. Post continues after video. “So you can go on the internet and buy likes, those commands are being sent to these rooms full of people who have got dozens of phones, and they’re just hitting like. That’s the artificial world of likes and clicks on the internet and that could also be views on YouTube. Anything that is a metric – number of views, number of likes, number of shares, these things can all be faked,” said Mr Long. It’s incredibly easy to buy these services – a quick Google will find you in front of one of these sites and it’ll set you back about $50 for 1000 likes. “They aren’t hiding, they call themselves crowdsourcing. In some countries, they aren’t committing a crime. But if they are, they just have their computers confiscated,” Mr Long told The Quicky abut the consequences. So how do you tell if someone has ‘crowdsourced’ their likes? “At a glance it’s very hard. If you look at a post and it has 2000 likes, the first thing to do is look at the amount of followers that person has. “If the ratio of likes to followers is out of this world, if they’ve only got 2000 followers and they’ve got 2000 likes, that’s wrong. 10,000 followers and 2000 likes that’s probably more useful,” said Mr Long. “When you click on those likes that’s when you start to drill down. “‘Joe Smith’ is not the kind of name click farm workers use. You’re looking for extraordinary names, repetition of any sort and also you’re looking for a spike. If something goes from 100 likes to 1000 likes in a small space of time it’s probably unlikely. You’d only know that if you follow that person regularly,” he concluded. There’s not a lot Facebook, Instagram and YouTube can do apart from crack down on the specific accounts. But just like in the criminal world, those running these operations seem to always be one step ahead.